Last evening, the National Law Enforcement Museum’s Witness to History panel discussion series re-examined the 2002 Washington, DC-area sniper case 10 years later. Panel members included Chief Charles Deane, Prince William County (VA) Police Department; Mr. Josh White, investigative reporter for The Washington Post; Chief Charles Moose (ret. ), Montgomery County (MD) Police Department; and Lieutenant David Reichenbaugh (ret. ), Maryland State Police. As many of us recall vividly, for three weeks in October 2002, the DC metropolitan area lived in fear of what was believed to be a single serial sniper who killed 10 people and wounded others in a series of random shootings in DC, Maryland, and Virginia. Ultimately, John Allen Muhammad and Lee Boyd Malvo were convicted of several of those murders. Investigating and arresting the two perpetrators, who came to be known as “The Beltway Snipers,” involved hundreds of law enforcement officers from multiple local jurisdictions, as well as agents from the Bureau of Alcohol, Tobacco, Firearms and Explosives (ATF); the Federal Bureau of Investigation (FBI); the U.S. Secret Service; and the Virginia Department of Transportation. Representatives from these agencies were in attendance at last night's event, along with two surviving family members and a victim of the sniper attacks. Additionally, pieces of evidence from the DC Sniper Task Force—now part of the Museum's collection—were on display, including bullets, tarot card, and letters left by the snipers for police. Sponsored by Target® and held in the Pew Charitable Trusts Building in Washington, DC, Witness to History: Washington, DC-Area Sniper Attacks, 10 Years Later shed light on a case that involved one of the biggest manhunts in recent history and required the complicated coordination of multiple law enforcement agencies under intense media scrutiny and a barrage of misinformation, rumor, speculation, and criticism. The panel discussion, moderated by National Law Enforcement Officers Memorial Fund Chairman & CEO, Craig W. Floyd, presented expert analysis and firsthand accounts from those closely tied to the investigation. A Q&A session allowed audience members to interact with the panelists at the end of the discussion. As the public face of the investigation, Chief Moose discussed his strategy for informing the public throughout the investigation, explaining why he held press conferences every four hours. “We insisted on maximum disclosure with minimum delay even when there wasn’t much to report,” said Chief Moose. “We didn’t know whether this was a 9/11 situation or an anger issue targeted at specific individuals,” said Lieutenant Reichenbaugh. All the panelists stressed the teamwork needed to solve the case. “We worked closely together and shared information with other jurisdictions,” said Chief Deane. Representing the media, which played a major role in the investigation and trial, Josh White described the news room at the time as "bedlam." He described the attacks as "scary, unexplained, and continuing," and went on to say that it was the "scariest thing this country has seen outside of an organized terrorist attack." This public event was the fifth in the Museum’s Witness to History series, which focuses on significant events in law enforcement history that shaped regional and national identity, told through narratives and accounts from those involved. Stay tuned for more events to come. For more information about the National Law Enforcement Museum’s Witness to History program, visit www.LawEnforcementMuseum.org/WitnesstoHistory. September means back-to-school for many Americans, including some future law enforcement officers. In 1888, the first centralized police academy began in Cincinnati, Ohio. 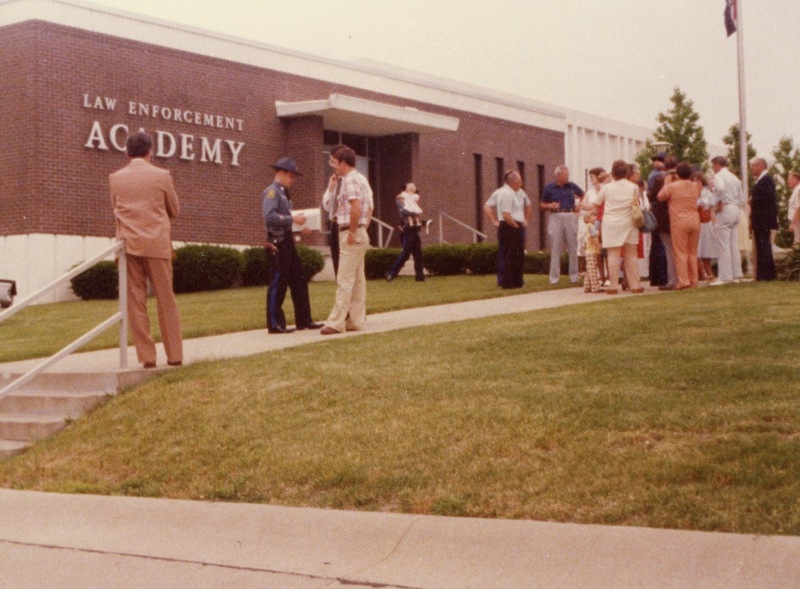 Since then, academy training continues to prepare individuals for one of many professional careers in law enforcement, as peace officers, corrections officers, detention officers, communications officers, coroners, and more. Academy students learn the necessary tactical skills and academic knowledge to carry out their duties as law enforcement officers. Check out these items from our collection that offer a snapshot of Academy life from the 1920s to the 1990s. This book is the Syllabus and Instruction Guide for The Police Academy of the New York City Police Department. It was published in 1925 by then police commissioner, Richard E. Enright. 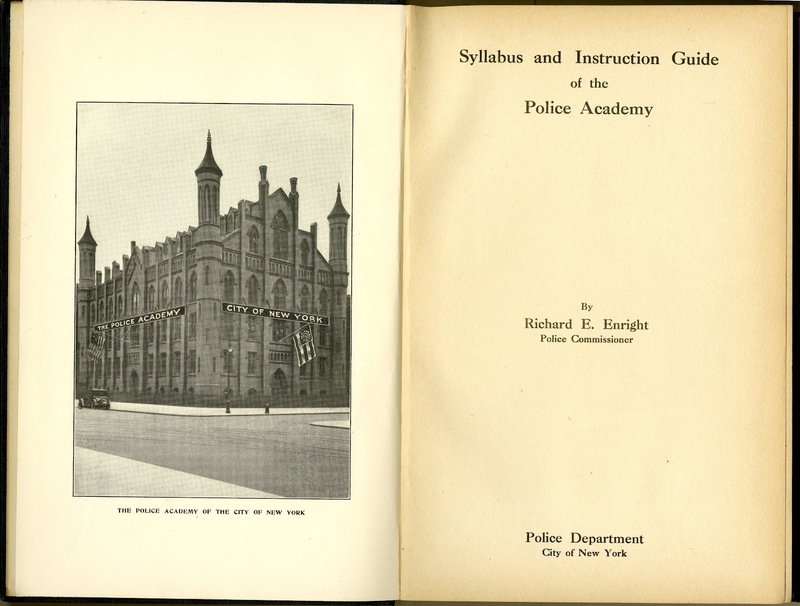 In the 1920s, the Police Academy of New York City was organized into eight departments, including one for instructor training. 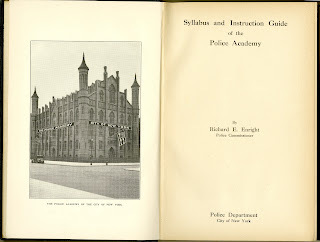 An article in The New York Times on April 23, 1925 announced the opening of the Police Academy in the Commerce Building of the College of the City of New York and stated that the college would help in planning new courses for the police school. 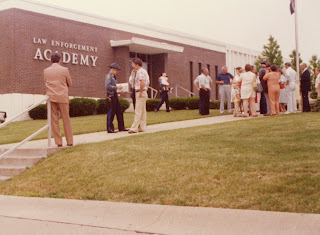 The First Basic Police Class of the Essex County (NJ) Police Academy is pictured here. Their class ran from October 10 to November 25, 1955. These officers went on to serve in various departments throughout New Jersey including the Chatham Police, Park Police, Irvington Police, Bloomfield Police, Montclair Police, and the Essex County Sheriff’s Department. Elizabeth Coffal (front right) with her Indianapolis (IN) Police Department recruitment class, including friend Betty Blankenship (front, left of Elizabeth). This class graduated in 1967. Elizabeth and Betty were the first women assigned to patrol in Indianapolis. Elizabeth M. Coffal (later Robinson) was born May 10, 1952 and died April 8, 2009. She was a policewoman, patrol officer, and eventually Sergeant of the Indianapolis (IN) Police Department from 1967 until her retirement in 1989. This snapshot was taken of Elizabeth after her graduation from Police Academy in 1967. Graduating class photograph of Los Angeles (CA) Police Department Academy, May 17, 1968. 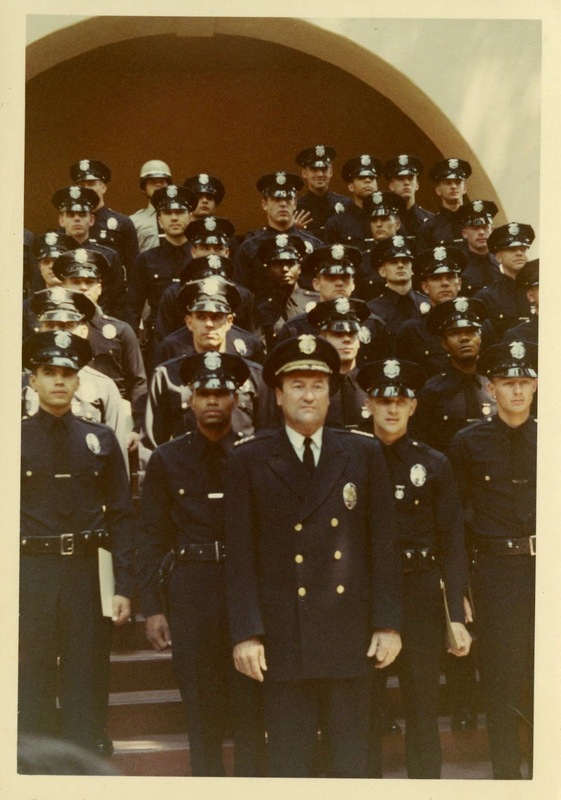 Included in this class was Arturo Placencia, the officer who arrested Sirhan Bishara Sirhan, who assassinated then presidential candidate Robert F. Kennedy at the Ambassador Hotel in Los Angeles on June 5, 1968. Placencia was 21 years old at the time and only three weeks out of Academy when he was called to the scene and made the arrest. Donald “Keith” Johnson began his law enforcement career as a part- time dispatcher for the University Police Department at Central Missouri State University. His goal was to join the Missouri State Highway Patrol, and although he obtained a Bachelor’s degree in criminal justice, attended many training schools, and held various law enforcement positions, he was unable to get into the patrol because of his eyesight. In the late 1970s, Johnson underwent a procedure called Kerontology. 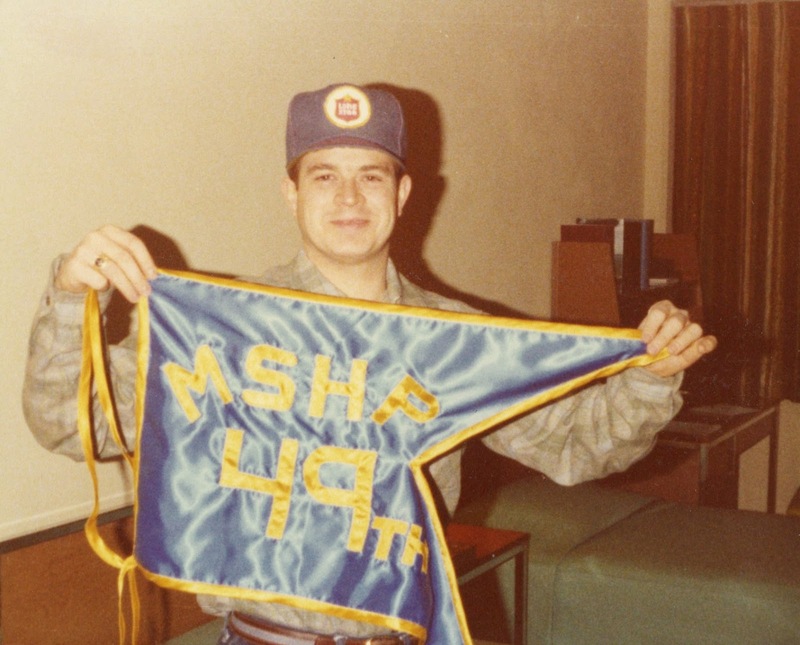 The surgery was uncomfortable, but well worth it: Johnson passed his physical and was accepted into the 49th recruit class, becoming a member of the Missouri State Highway Patrol on January 15, 1979. The two photos show Keith Johnson holding a “MSHP 49th” class flag and Keith with others outside the Academy on graduation day, June 8, 1979. 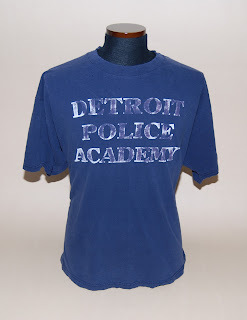 This t-shirt belonged to Officer Scott Stewart from his time at the Detroit (MI) Police Department Academy in the late 1990s. Officer Stewart was killed in the line of duty on August 11, 2002. You can read Scott’s story here. Do you have Academy stories, memories, objects, or mementos that you would consider sharing with/donating to the National Law Enforcement Museum? Please contact museum@nleomf.org. Thank You, Montgomery County FOP Lodge #35! Recently, Memorial Fund Director of Law Enforcement Relations & Development, John Shanks, had the honor of visiting Montgomery County FOP Lodge #35, where current Lodge President Torrie Cooke and immediate past President Marc Zifcak presented him with a $25,000 check made out to the National Law Enforcement Museum. Three years ago, John Shanks met with Marc Zifcak, then-President of FOP Lodge #35, to share his excitement about the forthcoming National Law Enforcement Museum. Marc Zifcak and Lodge #35 soon began working with the Montgomery County Administration to organize an innovative way to donate to the Museum project: a payroll deduction program that would accrue funds to support the National Law Enforcement Museum. The program was implemented and has been a great success. Over the past two years, Montgomery County law enforcement and support personnel have been donating to the Museum through payroll deduction. With an $80 million campaign goal to build the National Law Enforcement Museum, every little bit helps, and Lodge #35 went above and beyond to do their part. Everyone at the National Law Enforcement Officers Memorial Fund and the National Law Enforcement Museum extend our gratitude to Lodge #35, President Torrie Cooke, and immediate past President Mark Zifcak, for their dedication to helping us build this Museum. If your agency would like to look into setting up a payroll deduction program to support the National Law Enforcement Officers Memorial Fund or National Law Enforcement Museum, please contact John Shanks directly at JShanks@nleomf.org or 202.737.8529.